With China being in the news so much, coupled with my longtime interest in China as an intriguing destination, I could not pass up the great value offered by the Palm Desert Chamber of Commerce for the trip there for only 9 days on the ground in October 2010. The PDCC sponsors many trips for great prices around the world, so if you are interested, you should definitely check in with them. 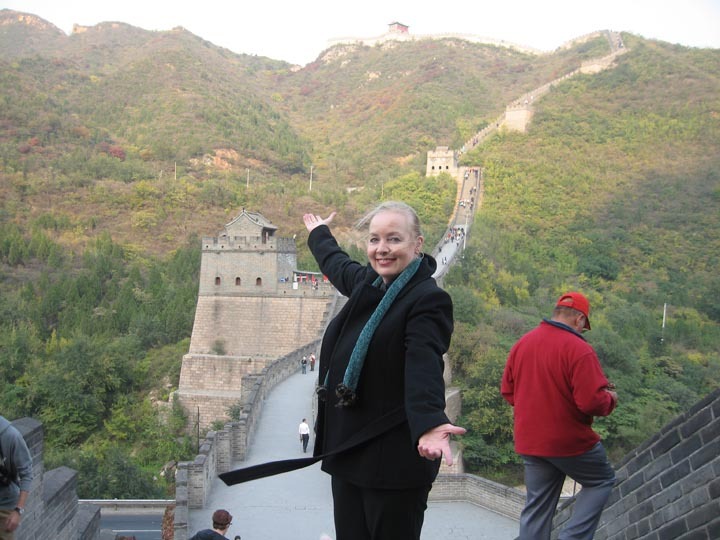 The trip to China is not for the faint of heart or mind! From the first day of our 9 day intinery, starting early in the morning, our intrepid tour guides had us constantly moving from one interesting site to another, all the while giving us a steady stream of information about what we were seeing and what life is like in China. 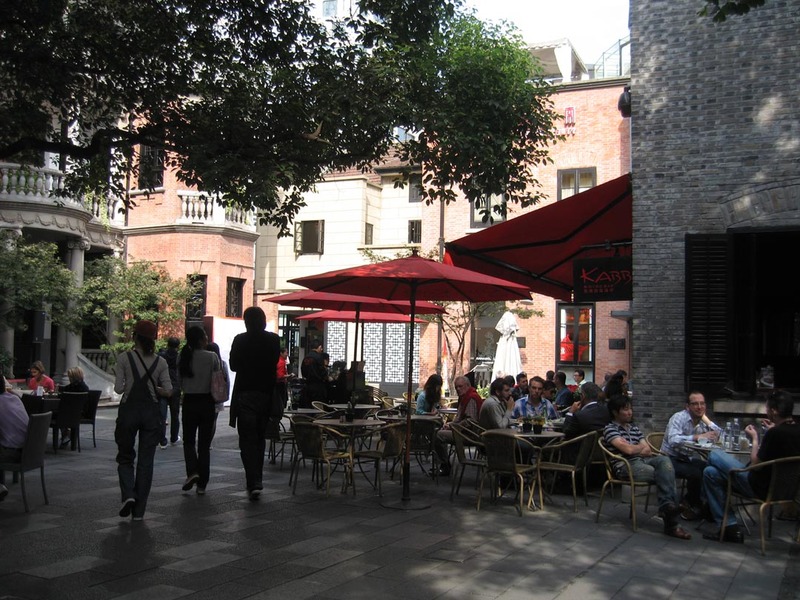 When our action-packed days were through, typically we would be exhausted, although one night many of us found the energy to go to a couple of bistro/bars in a very hip and popular section of Shanghai called Xintiandi, a renovated cluster of beautiful historic buildings and outdoor cafes with a European flair. 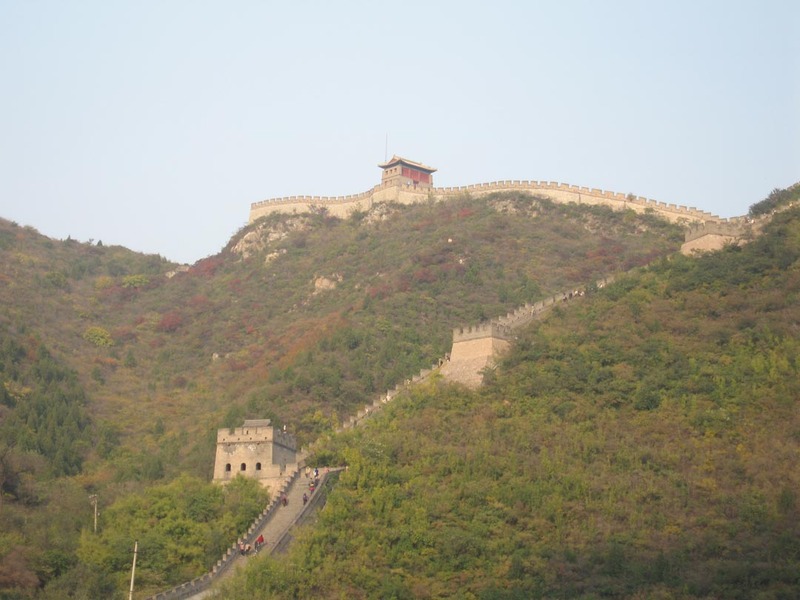 Seeing the Great Wall, and climbing up and down it, was a big highlight of the trip. It is over 4000 miles long as it snakes its way over hilltops and valleys. The stone stairs are steep and pitted, but it sure beat the monotony of the Stairmaster back at the gym! The Great Wall of China is an awesome sight! 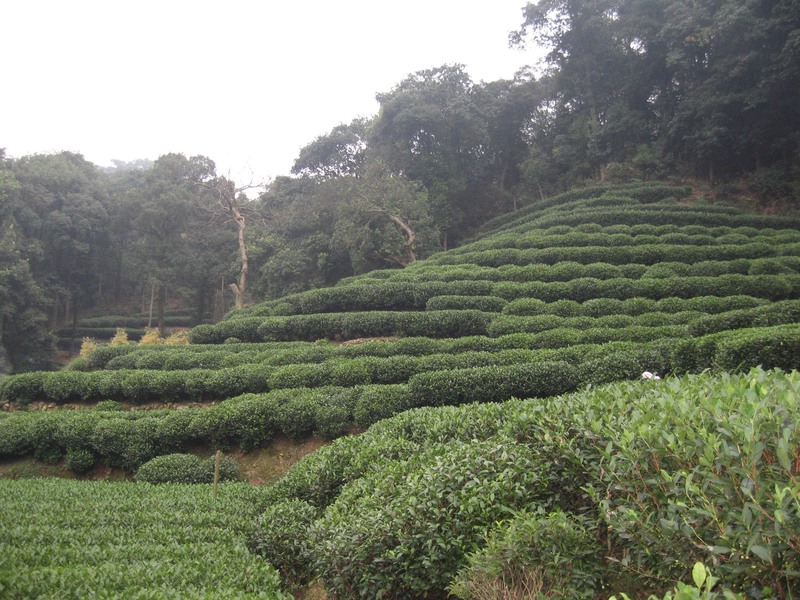 It was fascinating to learn about China’s traditional industries at the sites where the products are manufactured, including jade and pearl jewelry, silk, embroidery and even a green tea plantation. One hilarious memory is of all of us being paired up riding in a caravan of rickety rickshaws through the backstreets of an ancient and picturesque section of Beijing, while being hotly pursued by the amiable street vendors who followed us on their bicycles hawking their wares, such as colorful shawls and scarves. After our home-made meal in a chef’s humble home, the vendors cheerfully and persistently awaited us. I finally gave in and bought some, at a great price, of course! 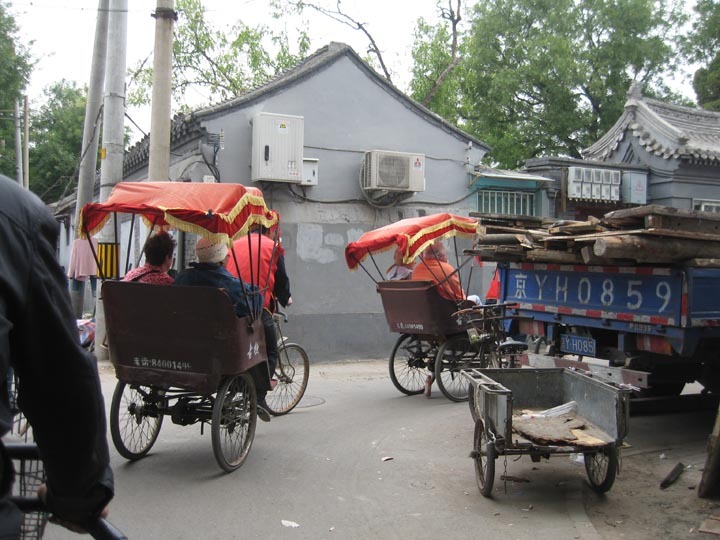 What a joyride we had in an ancient neighborhood of Beijing! Shanghai was truly astounding! It is said to be the largest city in the world, and after riding on the bus by thousands and thousands of high-rise apartment buildings and condos, I believe it! It’s almost overwhelming! 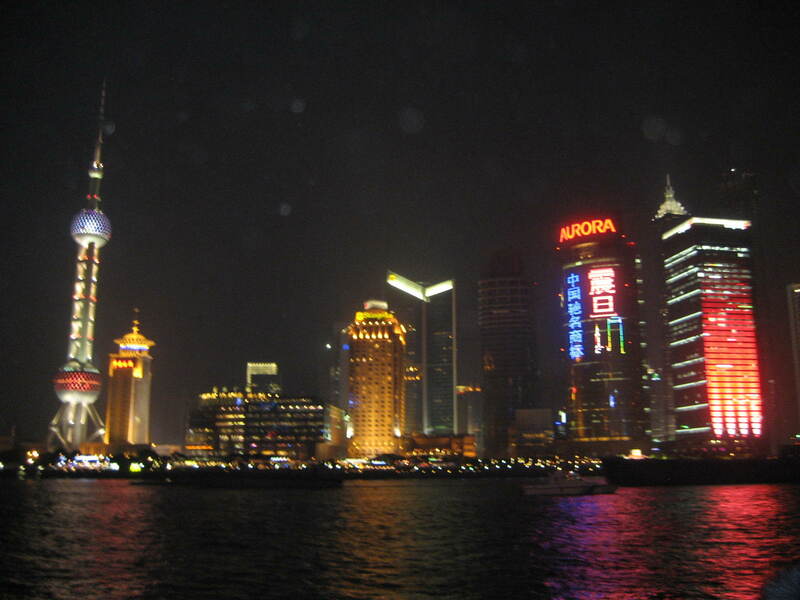 We did not spend as much time as I would have liked in Shanghai, so perhaps I will make a return trip someday. Spectacular skyline of Shanghai at night! We stayed at four and five star hotels, and all our meals were included, as well as the tours, except for we had to pay for some sidetrips and for tips to our guides. At under $2000, what a deal! It was a trip of a lifetime!